Home / Support / Documentation / RSMail! User Guide / Plugins and Modules / RSMail! - RSMembership! The RSMail! - RSMembership! 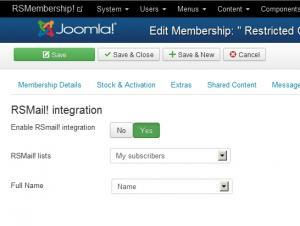 integration plugin allows you to register the membership subscriber to a RSMail! newsletter list. The integration parameters can be configured per membership. Having this into consideration, after you have installed and published plugin, you will notice the RSMail! integration tab within the Components >> RSMembership! >> Memberships >> edit a membership area. Enable RSmail! integration: if enabled, guest that register for the current membership, will be added within an RSMail! newsletter list. RSMail! lists: the list that the user will be subscribed to. After a RSMail! list has been selected, you can now perform the field mapping. Basically this allows you to specify which RSMembership! field will go into what RSMail! list field. 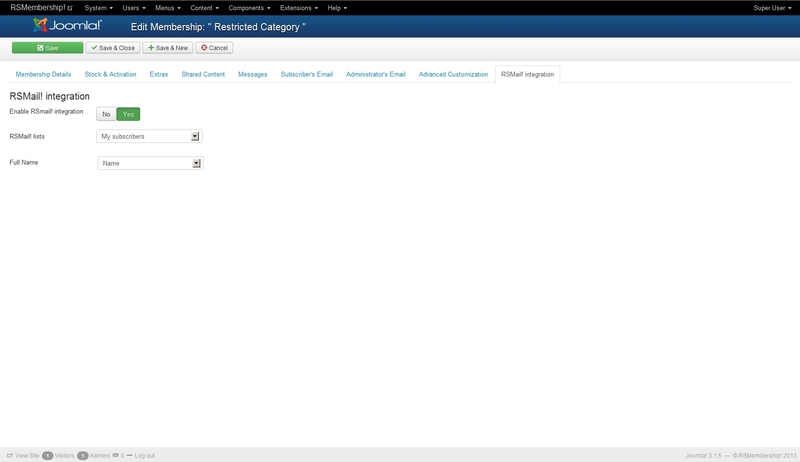 On the left side, the list field names are displayed, and on the right, you will have to simply select the membership field.